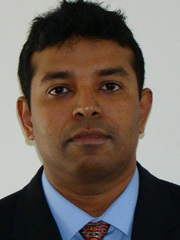 Dr. Datta has received his post-doctoral training at Beth Israel Medical Center, Harvard Medical School, Boston in the field of tumor angiogenesis. Motivated students are welcome for rotation in our laboratory. 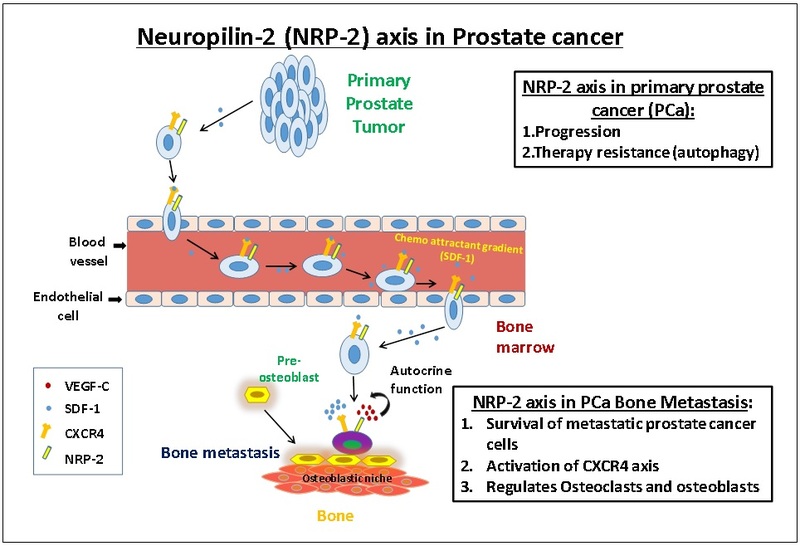 Neuropilin-2 axis in prostate cancer bone metastasis:: Our laboratory studies the role of angiogenic growth factors in promoting the survival and metastasis of cancer. We are particularly interested in the function of vascular endothelial growth factor-C (VEGF-C) and its receptor neuropilin-2 (NRP-2) in promoting metastasis in prostate cancer. We observed that NRP-2 was significantly expressed in prostate cancer cells metastasized in bone. We have identified a survival promoting function of NRP-2 axis in prostate cancer cells during redox stress by promoting the activation of mTORC-2 [Cancer Research Vol 69(15):6042-8]. We expanded our studies and identified that NRP2 axis also can protect the cancer cells from docetaxel therapy. Autophagy, a cellular process involved in mitigating chemotherapeutic stress, was identified as a downstream of NRP-2 axis in metastatic cancer cells [Cancer Research Vol 73(1): 160-71; Autophagy Vol 9(5): 1-2; Int J Radiat Biol. Vol 90(8):628-35]. A similar increase in NRP2 expression was also observed in human bladder cancer patient tissues. In collaboration with Dr. Michael Muders, we were able to show that high expression of NRP2 in human bladder cancer tissue is a poor prognostic factor for patients treated with radiochemotherapy [International Journal of Cancer Vol 136 (2) : 443-451] further validating the therapy resistance function of NRP2 in cancer cell. Currently, we are studying the underlying mechanisms of how NRP2 axis is regulating autophagy in metastatic prostate cancer cells. Our work indicated that NRP2 axis is regulating the endocytic activity in cancer cells and is therefore important for the maturation of autophagosomes in cancer cells during therapeutic stress [Cancer Research, Vol 76 (2): 418-428]. Further, in depth studies are in progress to understand the molecular mechanism of NRP2-regulated endocytosis and autophagy in cancer cells. We are actively collaborating in this project with Dr. Surinder Batra and Dr. Steve Caplan of UNMC and Dr. Michael Muders at Germany. We are also collaborating with clinicians from both UNMC, Mayo Clinic, Rochester and Duke University to determine whether high expression of NRP2 in metastatic cancer tissues can be a predictor of treatment failure. In addition to its role in autophagy in cancer cells, our study indicated the involvement of NRP2 in regulating the functions of cell surface receptors. One such receptors, which we have studied extensively is CXCR4. CXCR4 upon its stimulation by the ligand SDF1 (secreted by bone cells) help the metastatic cancer cells to home to bone. We observed the downstream signaling of CXCR4 and thus its function is dependent on NRP2. Bone cells such as osteoblasts and osteoclasts are involved in maintaining the bone homeostasis. It is often found that metastatic cancer cells in bone can influence the function of these cells, which in turn help the cancer cells to grow in the bone environment. We are therefore studying the molecular mechanisms responsible for establishing the communication between prostate cancer cells and bone cells (both osteoblasts and osteoclasts). 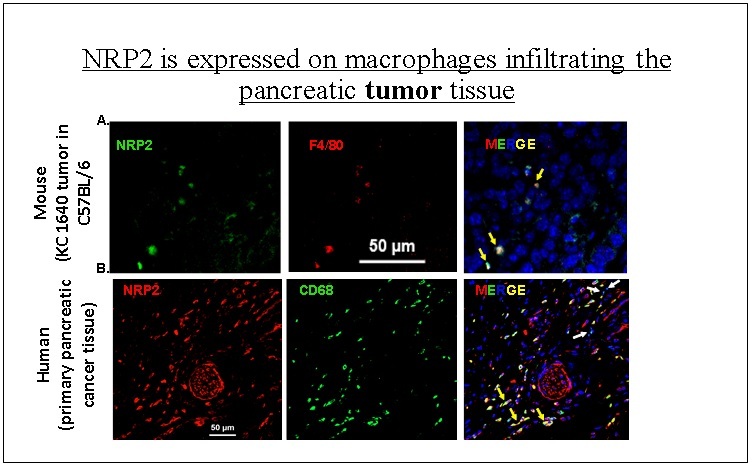 Neuropilin-2 axis as a target in pancreatic cancer associated macrophages: In a separate project, we are studying the role of NRP2 axis in immune cells present in pancreatic tumor microenvironment. Our results indicated that phagocytic activities of macrophages in the tumor microenvironment are dependent on NRP2 axis. We intend to determine whether NRP-2 axis in tumor associated macrophages (TAM), is necessary for its function. Targeting TAM would be an attractive strategy to fight pancreatic cancer because of its role in tumor promotion. We will therefore study whether NRP2 axis can be a valid target in TAM present in pancreatic cancer. Successful completion of this work will help us to test the therapeutic benefits of combining other established therapy and NRP-2 axis-inhibitor for the treatment of pancreatic cancer. We are collaborating for this work with Dr. James Talmadge, an experienced cancer immunologist in UNMC and with Dr. Surinder Batra, who is well known in pancreatic cancer research. Full list of my publications. Title: Development of Preclinical Models of Prostate Cancer Bone Metastasis to Study Neuroendocrine Differentiation. Title: Next Generation Sequencing study to identify aggressive prostate cancer in African American men. The major goal of this grant is to study the role of VEGF-C in protecting prostate cancer cells from oxidative stress and its implications on prostate cancer recurrence.